Fred (60) was born and raised in Paarl. As a devoted member of URCSA Immanuel (Paarl) he was a member of the CYM and organist for at least 25 years. He served a term as branch chairperson and a term as secretary of the presbytery’s CYM. He was also the choir master of the choir of URCSA Newtown. He is still a member of URCSA Immanuel-Paarl. Fred matriculated at Paulus Joubert Senior Secondary School and obtained his Primary Teaching Diploma lll (School Music) at Bellville Training College in 1980. He completed his BA and B Ed (Hon) at UWC and went to Stellenbosch University to obtain his Master’s Degree in Education. 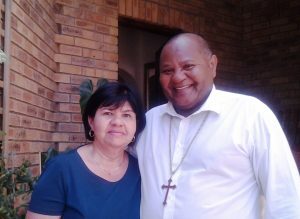 In 2014 I obtained the Post-Graduate Diploma in Theology and in 2017 his Master’s Degree in Theology. He was legitimized in 2018. The essence of his ministry is in Isaiah 61:1,2: “Deliver the good news to humble people, heal the brokenhearted, freedom for prisoners, announce the good year of Yahweh, announce Elohim’s vengeance and to comfort those who grieve.” This coincides with 1 Corintians 12:7-10. Fred is married to Claudette. They have a son, Jean-Calude and a daughter, Ilze and two grandchildren, Tamzin-Rose and Liam Noah. Contact Fred at fredfrolicks1@gmail.com or 083 384 0210 for more information.